The latest word, which comes from Korea’s ET News by way of macrumors.com, is that the next iPhones will have a notably smaller notch for the TrueDepth camera system. This will apparently be true for all 3 models expected in the fall. In addition to that, a sketchier rumor says Apple will be able to ditch the notch entirely in 2019! Amazon already discounts Prime for people with an EBT card to $5.99 a month, instead of $12.99. Now, according to geekwire.com, they will expand this program to people on Medicaid, too. Users will still get free 2 day shipping, Prime Video, etc. Amazon says they plan to add other ways for people on assistance to qualify for the discount moving forward. The 2 day delivery for people on Medicaid is especially interesting since Amazon is looking to get into the prescription business. Smartcams can bee cool to have for checking on kids, pets, or just for home security, but some can be a pain to set up, and even more so to get to work with other kinds, and with various systems. Now, Sony, Nikon, iPhone maker Foxconn, as well as others, are working together to make it possible for you to monitor video streams from different cams through a unified interface. Thenextweb.com reports that the makers are devising a specification called NICE so the footage from various cams can be split into scenes, indexed, made searchable and scannable in thumbnails, and more easily stashed in cloud storage. If all works out, there should be NICE cams and related products on the market by 2019. Self-driving cars are gearing up to hit the roads, and like in the US, the Brits are trying to get things ready. Techcrunch.com says regulators in the United Kingdom are shooting for 2021 as the year driverless cars without a safety operator can be rolling on the roads there. A number of issues have to be worked out, including who is the responsible party if there’s no driver, and how to allocate civil and criminal responsibility where there is shared control through some human-machine interface. If things go as planned, car makers may not have to worry one day about building right hand drive cars for the UK and a number of former British colonies that still drive on the left side of the road. It hasn’t been activated yet, but 9to5google.com has discovered a wake to shoot gesture that activates the camera. Basically, when you pick it up and hold it in either landscape or portrait picture mode, the camera app opens. It will work whether the phone is asleep or locked. The feature requires specific hardware. It’s not known if Google has held off due to concerns of launching the cam by mistake or couldn’t finish some work before launch, but let’s hope it comes in the future! An offer is in the works that will be the biggest tech deal ever. Broadcom has proposed buying rival Qualcomm for $130 billion. According to businessinsider.com, this would make Broadcom the third largest maker of chips and components for smartphones behind Intel and Samsung. It also might make the Qualcomm vs Apple lawsuit go away. As we reported last week, Apple is looking at ditching Qualcomm completely over that, and Apple is one of Qualcomm’s biggest customers that throws off most of the modem division’s revenue. The merger would have to be approved by shareholders and the Department of Justice due to antitrust concerns. Foxconn is apparently supplying System in Package tech for Apple Watch next year. 9to5mac.com reports that Quanta Computer was the original sole assembler of the smartwatch, and Apple added Compal Electronics this year, but only for older generation watches. Like many huge companies, Apple likes to have 2 or more suppliers for major components, to avoid getting gouged on price and unexpected supply chain jam ups. The invite is out, and so’s the date. 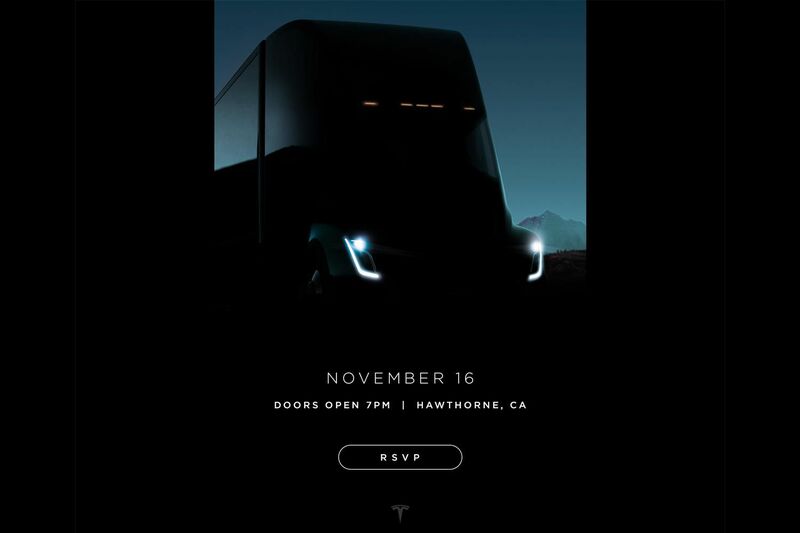 Tesla will preview its electric big rig on November 16th, in Hawthorne, CA. at 7 in the evening. Cnet.com notes that the twilight shot of the truck is from the right front quarter…the only other tease pic we’ve seen was from the front…yep…it just looks like the outline of a more zoomy big rig. ARM will have new chips out in time for next year’s flagship smartphones like those from Samsung that will boost performance by 30% while giving 30% better power efficiency. Cnet.com says ARM claims you will be able to run a phone’s chip at full speed for the duration of a movie, game, or VR experience! It’s the Cortex-A73 computing processor and Mali-G71 graphics processor. The graphics processor gives 50% higher performance with 20% energy savings. Samsung and a couple others have already licensed the tech…no word about Apple, but they’ve used ARM in the past. An Apple supplier, TPK…which is a division of Foxconn, has a silver nanowire tech rolling out that will allow for flexible touch screens. Since Foxconn is the major supplier of iOS devices like the iPhone and iPad, patentlyapple.com notes that there’s a high probability that you’ll be seeing these everywhere in the next 2-5 years. More to the point, TPK says they expect their clients to launch flexible touch panel devices in the 2nd half of 2016! If they’re talking about Apple, a folding 7 inch tablet or display that wraps around your arm will be one hell of a ‘one more thing! Stay tuned! One of the most boring, yet important tidbits has just dropped about the iPhone 7…bgr.com reports it will finally ship with 32 gigs of memory instead of the nearly useless 16 gigs in the base phone. No more cheapskate Apple buyers whining about having to delete pictures and songs from their iPhones anymore! 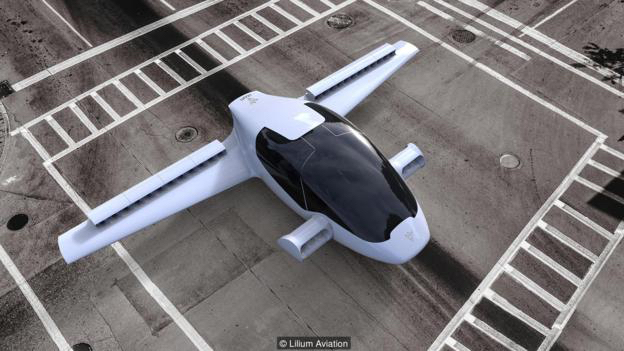 Lilium Aviation of Germany is working on an electric short haul private jet that could bring us closer to George Jetson’s flying car. According to BBC, it’s 100% electric, can fly 310 miles at 248 miles per hour, and has a ceiling of 9900 ft. It recharges overnight from a regular electrical outlet. It can land and take off from a back yard, and instead of one motor, has the redundancy of 36 small ducted fan motors.The 320Kw battery pack puts out 435 horsepower. It qualifies as a Light Sport Aircraft, so only requires 20-30 hours of training, and takes off and lands autonomously. Lilium has already flown a smaller prototype and is building a full sized one. They hope to be production ready by the end of 2018! New leaks about the iPhone 7…despite talk that it will be practically an iPhone 6S, it is reported to be more complex to build…perhaps little change cosmetically, but some new and interesting features under the hood. Bgr.com reports that both Foxconn and Pegatron have started hiring a month earlier than usual for a new model. Also, new leaked images show the antenna stripes at the top and bottom…no longer crossing the back, and a new pinhole between the camera lens and flash may be for laser autofocus…a feature LG has had for a couple years.